The precursor to the United Nations, the League of Nations, was conceived under the Treaty of Versailles in 1919 “to promote international cooperation and to achieve peace and security.” Unfortunately, it failed to prevent the outbreak of another world war. In 1941, with World War II in full swing, the Allies were already discussing a new international organization to ensure global peace after the war ended. The official need to replace the League of Nations was announced in the Moscow Declaration on October 30, 1943, issued by China, Great Britain, the United States, and the USSR. The following year at the Dumbarton Oaks Conference, these four nations drafted the specific proposals for the new organization’s charter. There were some disagreements about voting and membership issues, but they were hammered out at the Yalta conference in February 1945. The United States, Britain, and the USSR reached an acceptable compromise paving the way for the signing of the official United Nations charter on June 26, 1945 in San Francisco. 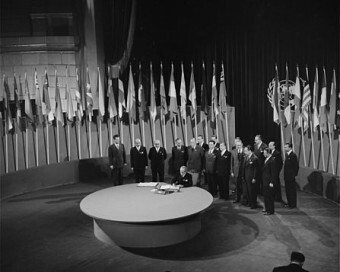 The United Nations charter, which is loosely based on Franklin Delano Roosevelt’s “Four Freedoms” speech, calls for the organization to maintain global security and peace, encourage social progress and improve standards of living, strengthen international law and further the expansion of human rights. We all have to recognize-no matter how great our strength–that we must deny ourselves the license to do always as we please. No one nation, no regional group, can or should expect, any special privilege which harms any other nation. If any nation would keep security for itself, it must be ready and willing to share security with all. That is the price which each nation will have to pay for world peace. Unless we are all willing to pay that price, no organization for world peace can accomplish its purpose. And what a reasonable price that is! Out of this conflict have come powerful military nations, now fully trained and equipped for war. But they have no right to dominate the world. It is rather the duty of these powerful nations to assume the responsibility for leadership toward a world of peace. That is why we have here resolved that power and strength shall be used not to wage war, but to keep the world at peace, and free from the fear of war. By their own example the strong nations of the world should lead the way to international justice. That principle of justice is the foundation stone of this Charter. That principle is the guiding spirit by which it must be carried out–not by words alone but by continued concrete acts of good will…..
… Artificial and uneconomic trade barriers should be removed–to the end that the standard of living of as many people as possible throughout the world may be raised. For Freedom from Want is one of the basic Four Freedoms toward which we all strive. The large and powerful nations of the world must assume leadership in this economic field as in all others. … Under this document we have good reason to expect the framing of an international bill of rights, acceptable to all the nations involved. That bill of rights will be as much a part of international life as our own Bill of Rights is a part of our Constitution. The Charter is dedicated to the achievement and observance of human rights and fundamental freedoms. Unless we can attain those objectives for all men and women everywhere–without regard to race, language or religion-we cannot have permanent peace and security.